The 42-year-old, known to be a suave and articulate leader, has been appointed as the working president as Chandrasekhar Rao would be focusing on national politics, a release from the chief minister's office had said last week. KT Rama Rao was the minister for IT, Industries and Municipal Administration in the previous government. 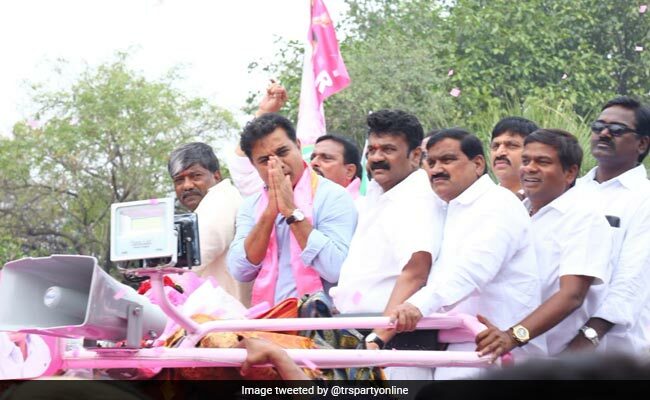 Telangana Rashtra Samithi (TRS) president and Telangana Chief Minister K Chandrasekhar Rao's son, KT Rama Rao, took over as the party's working president on Monday. Mr Rama Rao's appointment is being seen by many as a move anointing him as heir apparent to the party president. Mr Rama Rao who was the minister for IT, Industries and Municipal Administration in the previous government, has been elected from the Sircilla constituency in the December 7 Assembly elections. The TRS won 88 seats in the 119-member Assembly. Chandrasekhar Rao took over as the Chief Minister for a second straight term last Thursday.